“There are two kinds of writers,” Don Robertson liked to say, recalling the classic comparison of Thomas Wolfe to F. Scott Fitzgerald, “put-’er-iners and take-’er-outers. I’m a put-’er-iner. If I’m a loud mouth or a windbag, so be it. Anyway, that’s the way real people talk—around the bush, repeating themselves.” What Robertson was trying to capture, in all of his 18 published novels, had to do with the endless twists and turns of existence: the way we deal with what life throws our way, how we rise to our heroic moments (it involves the intensification of one’s sense perceptions) and the strange webs of family and fate that bind us together. The mother of the eccentric little girl from Shaker Heights in Victoria at Nine (1979) turns out to be the younger sister of Morris Bird III, the doomed boy hero of three of Robertson’s earlier books, The Greatest Thing Since Sliced Bread (1965), The Sum and Total of Now (1966) and The Greatest Thing That Almost Happened (1970). Grandpa Bird tells the little girl of his own early days and courtship in Paradise Falls, Ohio—where, we learn in Miss Margaret Ridpath and the Dismantling of the Universe (1977), his sister-in-law Pauline, the 1942 high school homecoming queen (The Sum and Total of Now), made out with the town’s future mayor, Lew Amberson. 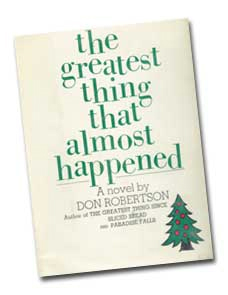 Paradise Falls, written between the second and third of the Morris Bird books, “began as a 945-page flashback”; Robertson kept a copy of his huge 1968 novel of small-town life on his desk “as a basic reference work.” Lew’s parents are the protagonists of Praise the Human Season (1976). And so on. The fictional town to which many of Robertson’s characters traced their roots was modeled not on Chagrin Falls, to which he moved in 1967 after the novel was completed, but on Logan, a small town southeast of Columbus where he spent several boyhood summers with his mother’s family after his father died. It is Robertson’s Yoknapatawpha County, a kind of Calvinist Eden from which all his later books, and their doomed protagonists, flow. Paradise Falls, which runs to 1,000 pages, unfolds over 35 years—from the end of the Civil War to the turn of the century. It was no surprise when Robertson was paid a hefty retainer by 20th Century Fox in the late 1970s to think up three of the four major plots around which a revival of TV’s Peyton Place was to revolve. 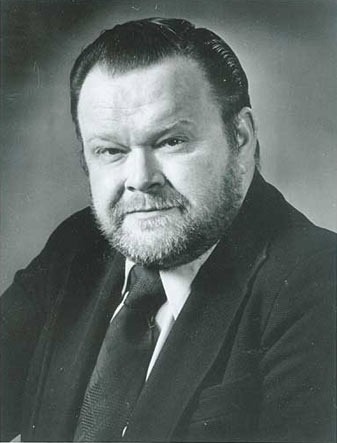 Born March 21, 1929, to Josephine Wuebben Robertson and Carl Trowbridge Robertson, an associate editor of the Cleveland Plain Dealer, he lived until 1946 in the east side Cleveland neighborhood of Hough and attended East High School. After a stint in the army and unsuccessful attempts to fit in at Harvard and Western Reserve University, he followed in his father’s footsteps, becoming a reporter and columnist for the Plain Dealer (1950–1955 and 1963–1966), the Cleveland News (1957–1959) and the Cleveland Press (1968–1982). In the late 1970s and early ’80s he reviewed movies and plays on WKYC-TV, Cleveland’s NBC affiliate, and won a following as a no-nonsense, tell-it-like-it-is radio and TV talk show host. He got involved in live theater (his first heart attack came during a rehearsal), about which he was passionate. But it was his novels he lived for, scribbling a paragraph while waiting to go on the air or typing another page while dinner was cooking. That composer’s sprawling, and deeply ruminative, symphonies seemed to strike a personal chord in the novelist. Robertson’s fascination with the sweep of history, and of human lives, was already evident in his first three novels (1959–1962), a Civil War trilogy. His next book, A Flag Full of Stars (1964), set during the 1948 election of Harry Truman, won the Putnam Award. Then, in 1965 and ’66, came the first two of the Morris Bird books, for which he won the Cleveland Arts Prize. Set in Cleveland between 1944 and 1953, each of the three novels revolves around a major event in the city’s history: the East Ohio Gas explosion, the Indians winning the pennant, and the Korean War. Reviewers compared the trilogy to the works of Mark Twain, Booth Tarkington and J. D. Salinger. The Dictionary of Midwestern Literature pronounced it Robertson’s “most significant fictional accomplishment” and predicted the three-book saga was “likely to assume an important place in American boyhood fiction.” In 1991, the Society for the Study of Midwestern Literature presented Robertson with its Mark Twain Award. Though his later books were sometimes criticized for their violence and “sordid” tendencies, no less a figure than Stephen King spoke warmly of Robertson’s work, which he said had been an inspiration to him as a writer. Robertson was deeply touched when King published the older writer’s 1987 novel, The Ideal, Genuine Man. A movie adaptation of The Greatest Thing That Almost Happened, in which the 17-year-old Morris is diagnosed with leukemia, aired on NBC in 1977 starring (in an interesting piece of racial re-casting) Jimmy Walker and James Earl Jones in the lead roles. Praise the Human Season went into paperback printings of more than 700,000 copies. A battler who fought his way back, with the help of his wife Sherri, from a series of crushing health problems—two heart attacks in 1974, several strokes, lung cancer and the eventual loss of both legs to diabetes—Robertson liked to refer to the nine novels he published after 1974 as his “posthumous” books. He was inducted into the Press Club of Cleveland’s Hall of Fame in 1992 and received the Society of Professional Journalists’ Life Achievement Award in 1995. Wheelchair-bound but hard at work on another book (he relished a new software program that simulated the printed page), he told two departing fellow writers who had dropped by to see him shortly before his death, “Hey, don’t forget me, you guys.” As if anybody could. Don Roberston died on his birthday in 1999. He supposed this was a good Christmas. The war in Korea had given people a lot of money to spend. Just about everyone was working—and making out very well. He did not as a rule think much about the war in Korea. Johnny Sellers, who had been wounded, and a guy named Don Schwamb, who had been killed, were the only people he knew who had been directly involved in it. And, to be honest, he’d never really given a hoot in hell for Don Schwamb, who had been a loudmouth and a goddamn bully. Don Schwamb had been drafted at eighteen in the summer of 1951, and that fall he was in Korea, and that winter he was killed, and it was as simple as that. The way Morris Bird III understood the story, Don Schwamb had been picked off by a sniper while driving a truck somewhere near a place called Orijong, which was right at the edge of something known as, ha ha, the Demilitarized Zone. Don Schwamb’s younger sister Bertha attended East High, and she told her friends he had been shot right through the head. Bertha Schwamb was fat, and she looked like the cleaning women Morris Bird III occasionally saw slopping through the halls on afternoons when he stayed after school late for basketball practice or whatever, and she seemed to take great pride in her brother’s death, as though by dying he had become something great and renowned and legendary. But the plain fact of the matter was that Don Schwamb had been a bully, the sort of guy who would torment little kids, take away their money and then beat them up anyway. He walked as though he wanted the streets to tremble . . . one heavy foot, gallumph, and the other heavy foot, gallumph, with his thumbs hooked in his belt and his face all dark and bad, he walked as though he dared the world to get in his way, and he was about as popular as a sack of warts. So how could you feel sorry for him because he was dead, and how could you think of him as being any sort of hero? Christ’s sake, a hero didn’t beat up little kids and take away their money. Being dead changed nothing, and anyone who thought otherwise just didn’t know which the hell end was up. Only truth survived, not sentiment and certainly not wishful thinking. (And truth always had to be faced, right? How could you get away from it? By holding your breath? By pulling the covers over your head? Oh, Jesus . . . Jesus . . .) Morris Bird III shuddered. . . .Doctors were only human, which meant that something they were wrong, but of course they didn’t want to admit they were wrong, and so you had to prove it to them.
. . .[T]he Public Square spun and sparkled with neon, and an immense Christmas Tree stood all green and white over in front of the Higbee Co. building, and he saw great neon candles, and a great neon sign that said NOEL, and another great neon sign that said MERRY CHRISTMAS, and another great neon sign that said PEACE ON EARTH, and all these great neon signs had been made soft and fuzzy by the whirling snow, and the sidewalks were all asquirm with people, and he was aware of stockingcaps and babushkas and teeth and feet and white breath. He walked quickly, but he did not walk too quickly. It was important that he not seem too anxious. This was a very big thing, and he could not afford to lose control. (He told himself: Think of the way old Coop would do it. The slow walk, with the bad guy at the other end of the street. You face him squarely, and you do not tremble. And you do not hurry. That is Frank Miller down there at the other end of the street. You face him squarely, and you will not show a thing. It would be giving away too much, and he would take advantage.) And so Morris Bird III made sure his breath came evenly. Nothing could be revealed. Listen to the Truth. It abounds. Everyone has his own truth, and every truth is true in the eyes of its beholder, but all individual truths are simply fragments, and thus the only true Truth (the only true and complete and unswerving truth) is the sum and total of all the right and proper—and incomplete—individual truths. Ah, this place. It is a saint. It is a whore. It is all. Here is a surprise in May. The war is finished, and today the men of the old Paradise Falls Blues are coming home. The sunrise is a green thief, green and moist. It has abducted the night. A red squirrel sits chattering high in a pin oak behind the Underwood place on Cumberland Street. Young Phil Underwood, darkly handsome, lying inertly, his bones unvexed by sleep, makes fists. The red squirrel is speaking for him. The red squirrel wants to fight. It is a brave and unpleasant red squirrel, and it is Phil Underwood’s brother. The thieving dawn brings a pale stuttering wind, and here and there, hugging the grass, are thin tracings of mist. The wind spins the mist, and the mist goes away. On Main Street the flags and banners hang limp. The wind is too weak to make them move. Leaves rub. Phil Underwood is eighteen. His parents never should have deprived him of this war. He cannot, however, hate them. It all would be so easy, if only he could hate them. He listens to the red squirrel, and the red squirrel's anger is dry and terrific. Phil Underwood closes his eyes. He hears drums and gunfire. He imagines himself brandishing a great silver sword. They are coming, these survivors of the Paradise Falls Blues, in the steam cars of the Columbus, Paradise Valley & Marietta. The train is scheduled, God willing, to arrive at 11:38 this morning. Phil Underwood will be at the depot. He will stand off to one side. And he will mourn. And his parents, his loving parents, will understand not a thing.